Heel Pain caused by Plantar Fasciitis is an inflammation of the plantar fascia at its insertion onto the calcaneus, or heel bone. The root cause behind heel pain is equinus, or a tight Achilles’ tendon. With a tight Achilles’ tendon, there is limited ankle joint motion. With limited ankle joint motion, the foot has to work harder, or over-pornate, to produce normal gait. Over pronation, over time, creates an abnormal pull on the plantar fascia, which can become irritated and become very painful. Some things that aggravate or make plantar fasciitis worse are: bare feet, flip flops and flats. Usually a shoe with a slight heel will relieve the pain. For Acute Plantar Fasciitis, the Triad of Treatment is Stretching, Treating the Inflammation, and Splinting the Fascia. The key to stretching exercises is lengthening the Achilles’ tendon. 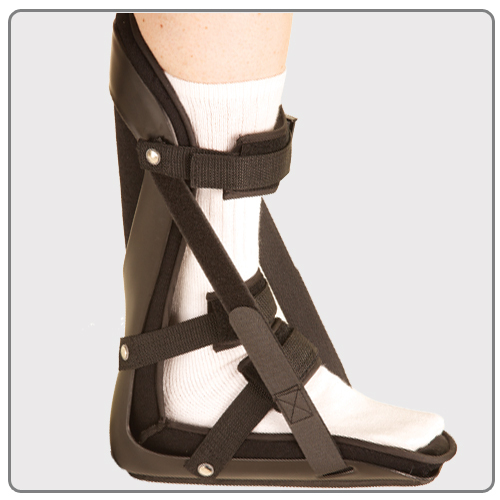 This allows more motion at the ankle joint, thus relying less on the plantar fascia for normal gait. Equinus, or a tight Achilles’ tendon, is the root cause behind plantar fasciitis. Inflammation of the plantar fascia is what causes pain. Treating the inflammation can be done with steroid injections, oral steroids, oral NSAIDs, and ice massage. This is done to help prevent the fascia from flattening out with each step. Each time the fascia flattens out; it pulls off the heel bone, and recreates the pain. ESWT is an FDA approved form of treatment. It is a non-surgical approach to pain relief that is used regularly to cure common problems like Chronic Plantar Fasciitis and Chronic Achilles Tendonitis. The therapy works by targeting shockwaves directly to the area that is experiencing pain. This is a non-invasive procedure that includes 3 weekly sessions that typically last less than 30 minutes per session. Watch a video! This procedure is done in the Operating Room Suite under local or regional anesthesia. Blood is taken from your arm and the platelets are removed. Your body’s own platelets are then injected back into the plantar fascia. This provides healing potential for CHRONIC PLANTAR FASCIITIS. This procedure is also done in the Operating Room Suite. This technique involves the injection of stem cells, with or without Platelet Rich Plasma, into the plantar fascia to treat the stressed connective tissue. These shots can work better than the traditional cortisone shots for CHRONIC PLANTAR FASCIITIS, since they not only soothe the pain, but they regenerate damaged tissue. If the above mentioned conservative therapies fail, a surgical release of the plantar fascia may also be performed. An incision is made on the bottom of the foot and the contracted, scarred fascia is released. This can also be performed using an endoscope. If you have plantar fasciitis, contact one of the Foot and Ankle Specialists at Academy Foot and Ankle to see which treatment, or combination of treatments is right for you.